Here comes a collection of LineageOS 13 Marshmallow ROM for available devices (OFFICIAL and UNOFFICIAL). Here we also have a list of Lineage 14.1 ROMs for available devices, where you can keep an eye to know if the Lineage 14.1 is available for your device or not!! In addition, Android Oreo has been released since a long time and here is the Android Oreo based Lineage OS 15 Oreo ROMs list for available Devices. I don’t know if you are aware of the fact that Lineage OS is the continuation of CyanogenMod and there will be no development happen further on CyanogenMod from here. CyanogenMod 14.1 is the last development and further development from here will happen on the CyanogenMod codebase but in the name of LineageOS. Earlier there were many unofficial CM14.1 (CyanogenMod 14.1) ROMs and OFFICIAL CyanogenMod 14.1 (CM14.1) ROMs available but after CyanogenMod website is taken down, the OFFICIAL NIGHTLY builds will not be accessible at all. This page is dedicated to maintain the available LineageOS 13 ROMs available till date. After CyanogenMod’s pull down, Lineage OS has taken off even if things were not as easy as one thinks in this complete re-branding of CyanogenMod to LineageOS transition. For now this page may not have a great count of Lineage ROM devices but eventually this list will grow bigger and bigger eventually based on the availability of Lineage OS 13 ROMs. Just stay tuned to this post if you want the latest LineageOS 13 ROM for your Android device. It is not guaranteed that your device will get an update of Lineage OS but you can hope for the best always. You may also know that the Official Lineage OS 13 and Lineage 14.1 NIGHTLies along with EXPERIMENTAL build are also getting released for different devices. There will be no separate page maintained for an official build for a separate device. Individual pages will be updated with official LineageOS 13 but where an official build is not available, will only have Unofficial builds. 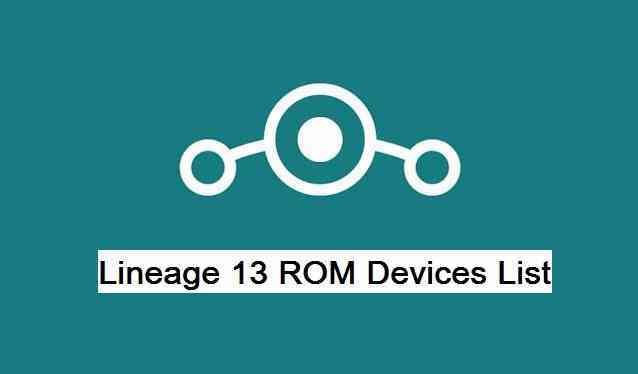 If you are on CyanogenMod 13 ROM then here is a guide that explains how to switch from cyanogenmod 13 to Lineage OS 13 without wiping data. For which ASUS phone do you want the LineageOS ?? I need lineage 13 rom for lenovo s60-a plz. I’ve found that Samba fails under Nougat and also Xposed isn’t supported by Nougat yet. I’m hoping to move to Lineage-OS 13, so that the transition to 14 when the above two get support, is going to be much more cleaner. I need rom for Huawei Nova Plus (MLA) please !!!! Hello. Any plans for a LG GPad XII? Can someone help out with this? I see you support Samsung Galaxy Tab Pro 8.4. Will you also support the 10.1? I am currently running cm-12.1-20161016-NIGHTLY-picassowifi. Will you release an update for the Sansung Galaxy J1 2016 J120H? If you are able to use the camera and music player by using third party apps then that’s still fine. The built-in apps might be buggy in this case and either the developer is unaware of the fact or he has no time to fix this. can u share the link for lineage os 13.0 for samsung galaxy star pro GT S7262…. Is there any chance Bluboo Dual will get a rom? I have not found Lineage OS 13 for Galaxy E5 anywhere. I will update here as soon as I will find. Lineage OS 14.1 is the Android Nougat version and is the latest as compared to Lineage OS 13 wihch is Marshmallow based. Hi Fawmy Marso, I will add the Lineage OS 13 for Xperia ZL the moment I will find. Basically, Lineage OS 14.1 is the Android Nougat version and is the latest as compared to Lineage OS 13 wihch is Marshmallow based. Will it be available for moto g4 plus? when Redmi 1s will get the Lineage 13 ROM ? It seems the Lineage 13 for Redmi 1s is not yet available. But you can try the Lineage OS 14.1 for Redmi 1s.